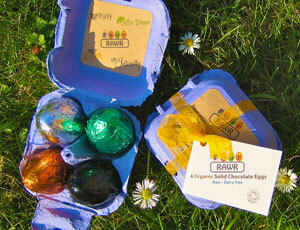 Sorry, raw Easter eggs aren't available for sale this year (here's why), what about entering our Easter Giveaway instead? Chocolate contains cocoa solids 70% minimum. 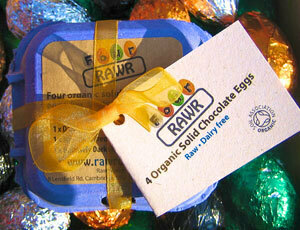 Wrapped in fully recyclable foil, 100% recycled and recyclable egg box, organza ribbon, and recycled card gift tag. Yellow kraft paper padding. Cacao Butter*, Cacao Paste*, Agave Nectar*, Cacao Powder*, Carob*, Orange Oil (0.08%)*, Vanilla*. Cacao Butter*, Cacao Paste*, Agave Nectar*, Cacao Powder*, Carob*, Mint Oil (0.08%)*, Vanilla*. Cacao Butter*, Cacao Paste*, Agave Nectar*, Cacao Powder*, Carob*, Vanilla*. It would be really good if all the products had the same fat ratio as the intensity. What is really good is that there is no sugar in these! - Well done & thank you! THE BEST RAW CHOCOLATES EVER!!!!! !